The rapid growth of Genetic Science enables the couples – and especially those with a serious family history – to bear healthy children. Thanks to Pre-implantation Genetic Diagnosis embryos with chromosomal aberrations and genetic diseases can be detected and precluded so that only the healthy ones will be transferred in the woman’s uterus. The procedure is not very different from a cycle of In Vitro Fertilization with embryo transfer at the stage of blastocyst, except that it includes the biopsy of the embryos in the embryologic lab. With the process of biopsy, blastomeres (cells) from the embryos are isolated and analyzed in an appropriately trained genetic lab. The biopsy of the embryos is performed in different stages (3rd day of hatching or blastocyst) and depending on the result we proceed into the embryo transfer of the healthy embryos. Alternatively, the biopsy of the polar body of the embryos is performed. In this way, in cases where the maternal factor is mostly implicated, we test the quality of the eggs alone without intervening to the embryo. 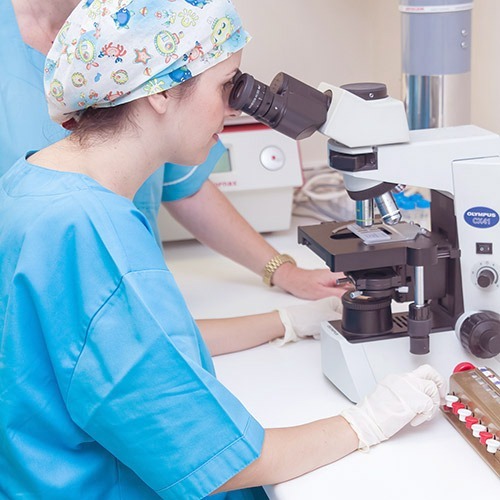 The training of the embryologists of our Center in the techniques of the Pre-implantation has already started since 2000 and continues until today with the most sophisticated techniques. Besides, this is also confirmed by the high success rates in many cases of thalassemia and sickle cell anaemia as well as in rare diseases like neurofibromatosis, Stargart Syndromes, XLA, etc. Sealing the success and the innovation that characterizes our Center, we accomplished the first pregnancy worldwide of a woman with achondroplasia (nanism) after a pre-implantation genetic diagnosis in combination with an embryo transfer in an artificial cycle following the cryopreservation and thawing of healthy blastocysts.